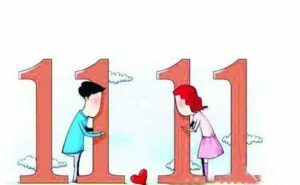 Single’s Day is celebrated in China every November 11th. In the 90’s, it used to be a campus party to celebrate blind dates. 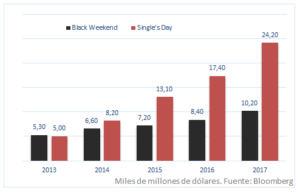 In 11/11/11, Alibaba (also known as Aliexpress in Spain) launched a campaign of coupons for the celebration and it turned out to be the best day of sales in November. China is preparing for this Day of Massive Online Sales, and we will see if the giant Alibaba beats records this year, surpassing the 25 billion US dollars in turnover reached in 2017. The sales expectation for 2018 increases to 32 billion dollars and all logistics companies that work with ecommerces have already prepared for the week of more online activity, with high-speed trains exclusively for sending packages. Amazon incorporated this strategy since 2014 to take advantage as well and Alibaba has internationalized discounts on its platform. So, November 11th promotions will be also available for other countries where Alibaba Groups runs the business. Important: If you have an online business, you can take advantage of this growth of digital sales. 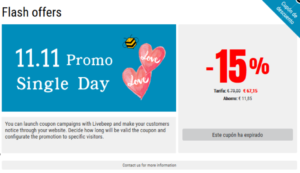 We recommend you to use your Livebeep tools to offer special discounts for Single’s Day. If you have Adwords, create a specific campaign for the Single’s Day with really attractive promos and synchronize it with Livebeep. Create a campaign with special coupons for the Single’s Day. Send a newsletter with interesting information about all the activities you do for the Single’s Day introducing all the discounts you offer. If you have single customers identified, remind them to celebrate this day and love themselves as much as they would do to a partner.